There is so much to learn when studying plate tectonics! Luckily, the website www.learner.org has created a wonderful resource you can use while doing your research. The Dynamic Earth interactive includes information about Earth's structure, plate tectonics, and plate boundaries. It even has a quiz you can take to self-check your understanding of these concepts. 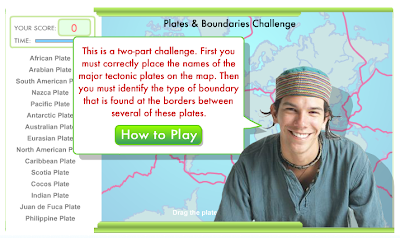 The Dynamic Earth interactive website from www.learner.org is a great place to learn all about plate tectonics. We spent some time today mentoring Ms. Kirsten's class. We worked hard trying to help them learn how to tie their shoes! Ms. Kirsten reports that THREE of her students learned how to do so today! Teaching Ms. Kirsten's students to tie their shoes. Sometimes a simple act that we do so easily daily, such as tying shoes, can be quite tricky to teach someone else how to do. This week we used red cabbage juice as a pH indicator. First, we boiled a head of red cabbage in water. We then let it cool and strained it. We then placed the cabbage juice in a variety of liquids (vinegar, dissolved baking soda, ammonia, and tooth paste). The mixture changed color based on the pH level of the liquid. We matched the color to the following chart to find the pH. First, we broke apart our red cabbage. Then, we cooked it for a while. 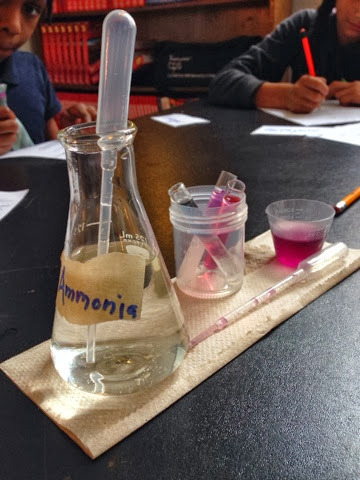 Finally, we strained it and used it as a pH indicator! This experiment is simple to do at home with your family. What is the pH of other liquids found in your house? Walk along the east side of the circle using the sidewalk. 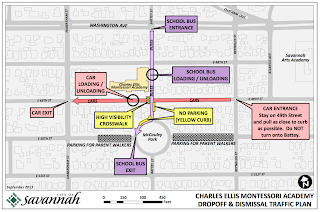 The above plan is in effect from 8:00am – 8:30am and 2:30pm – 4:00pm. It is necessary to have 100% compliance of the above plan to prevent pedestrian and/or vehicle incidents, as well as issuance of citations. Metro will be working with us to enforce obstruction of traffic. In following with our Montessori philosophy, we ask that you keep grace and courtesy at the forefront as we all adjust to this new plan. Offer one another friendly reminders and hold each other accountable. 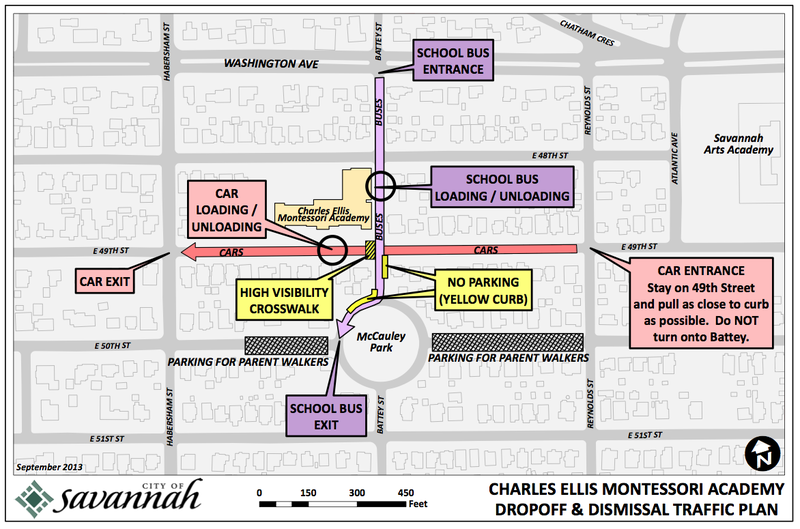 The purpose of these changes is to benefit our children and improve the current level of safety. We thank you all for your cooperation and support of these changes. Mr. Vinay gave us a lesson on why soils have different textures using a special device called a sieve. The sieve is made up of a number of screens that sort the contents of the soil based on its size. When soil is washed through the device, it neatly sorts it! Thanks for the lesson, Mr. Vinay! Students observe the soil sorted by the sieve. I know most of you are disappointed that our classroom pet, Georgia the chinchilla, has not found her way to Ellis yet. Keep your fingers crossed that we will get the ok to bring her in soon. In the meantime, I'd like to introduce you to our substitute classroom pet: Ratey, the math cat! Ratey will help us with our math studies associated with ratios, proportions, and unit rates this week! 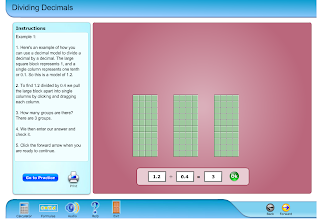 Ratey is from a great site called Math Snacks that you will most definitely want to check out. It includes other funny math videos and games. The games include Ratio Rumble, that can be played online or downloaded at the App Store for your iDevice. ($1.99) Be expecting some math homework Monday and Tuesday night, and a test Thursday. Please take initiative to practice what we talk about in class during your work time and at home so you are best prepared for the quiz. Don't forget about your Compass Learning assignment! This can be completed at school or at home. Please remember that your "Rake the Leaves" choice sheet is due Friday. Your final test on soil will also be Friday. You can use the study guide I gave you last week to help your prepare. Also, take a look at the booklet we've been using during our lessons. When creating the test, I used both to come up with the questions to include. I'm really excited for the lab this week! We discussed briefly the effect pH levels have on the fertility of soil. In lab we will test pH levels of various household liquids using a unique indicator: cabbage juice! 1. Progress reports will be sent home Tuesday. Please review them with your parents, sign them, and return them Wednesday morning to your homeroom teacher. 2. For my homeroom students, Scholastic book order money and forms are due by Thursday. 3. Since this Friday is the last of the month, it will be a FREE dress down day! 4. Just a reminder that I keep a classroom calendar that includes these and other important classroom dates to keep in mind. You can access it by clicking "classroom calendar" at the top of the page. 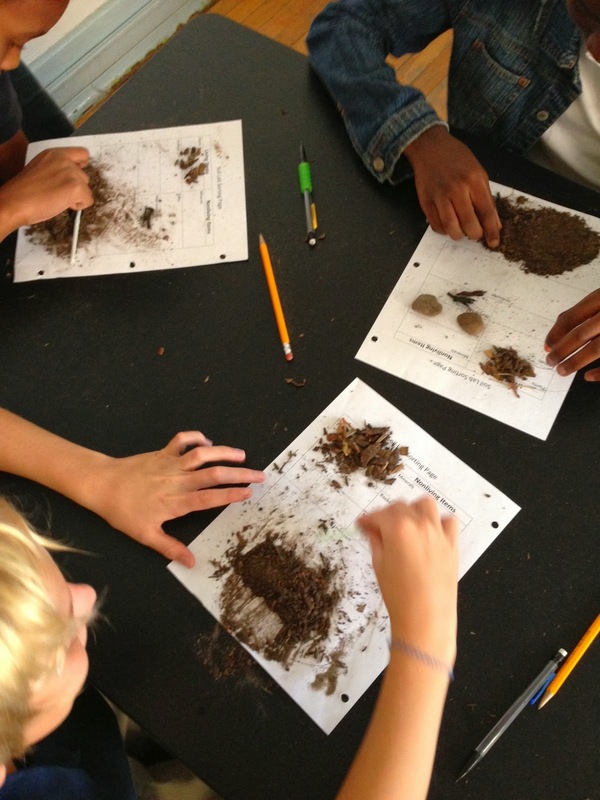 Students "dissect" soil and sort what they find to discover its composition. We had a wonderful time today at Skidaway Island State Park! We started in the Interpretive Center with a lesson on fossils. We then moved outside for a nature hike on the Sandpiper Trail. We ended our day with a relaxing lunch in the picnic grove. A special thank-you goes out to all the rangers at the park for making our trip something to remember! Check out these pictures from our trip! Please welcome our new resident scientist, Vinay Arora! He will be in our classroom two days a week to share his research and help us with our work. Mr. Vinay is a Masters student at Savannah State University. He will be working with students through the National Science Foundation GK12 program to assist teachers in math and science. Mr. Vinay's research focuses on predator-prey interactions of zooplankton. He uses computer tracking to observe behavioral responses. Mr. Vinay has an extensive background in computing and networking. His interests include music production, cycling, kayaking and SCUBA diving. He is excited to be working with us and is enthusiastic in promoting marine science in the classroom. Welcome to Ellis, Mr. Vinay! Be prepared for two nights of math homework this week, and a quiz on division of fractions on Thursday. I'm excited to start using a very powerful online program called Compass Learning as part of our math studies. We will use this program to practice the math skills we are working on in class, and also give you individualized math practice based on your strengths and needs as discovered using the MAP test you took recently. You will be required to complete at least one Compass Learning assignment each week during your worktime. Please keep in mind that this program is also available for you to use at home in the evenings and on the weekends for extra math practice. It's all about DIRT in science class this week! 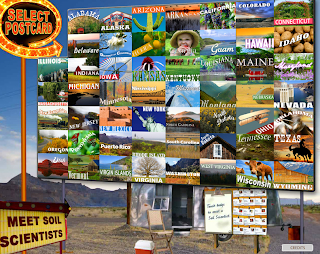 We will get our hands dirty as we discover many amazing facts about soil! We'll use an interactive text on Monday to start our investigation. Then, I will set you free to do your own research. To guide you along, you will complete the following choice sheet. It will be due Friday, September 27th. Don't forget that our fieldtrip to Skidaway State Park is this Thursday. Please turn in your permission slip and money ($2.00) by Tuesday to attend the trip. While there we will discover fossils found on the island and take a nature walk. The weather is shaping up to be pleasant this week, so I'm looking forward to a lovely day in the state park. I hope you are, too! Free homework help at www.tutor.com. The Live Oak Library system is offering all students with a library card FREE access to online tutoring! By logging onto www.tutor.com, you can have one-on-one tutoring sessions with a professional tutor. This service is available to you every day from 3:00-10:00 pm, so it's great for help with homework! The only thing you need to get started is a library card. If you don't already have one, click HERE to get a card. Once you have your card, click HERE to start your tutoring session. This service normally costs $40 an hour, but the library system is offering it to you at no cost! 1. The coversheet where you will sign your signature. Our email addresses are also on this sheet, if you need to contact Ms. Carol or myself. 2. A form about your rights as a parent from Ms. Esther. Please sign this. 3. A field trip permission slip for Skidaway Island State Park on September 19. This fieldtrip costs $2.00. Please by Tuesday, September 17. 4. Grade sheets for each subject. The present grade for each subject is next to the name of the subject. 5. Workplans from the previous two weeks. This week, Ms. Diane is leading the classes in an activity where the students are creating edible rocks based upon how they form in nature. Bon appetit! 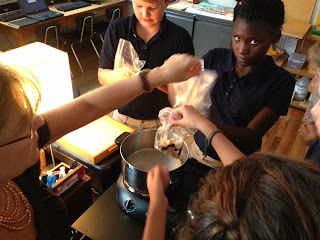 Ms. Diane helps the students create "igneous rocks" by melting chocolate (magma) and allowing it to cool back into a solid. In math this week, we will be reviewing division. I know division is something that you have been doing for a few years now, but I really want to take a deep look at what it means to actually divide numbers. After a review of long division on Monday, we'll take it up a notch and throw some decimals in the dividend and divisors. Be sure to try your best on your classwork and homework this week because we will have a test on division Thursday. 2. As you finish your menu sheet, I will have two choice labs associated with the rock cycle that you are more than welcome to explore. Please remember that only two people at a time can work on each lab, copy the lab procedures and answer questions on a piece of notebook paper to be submitted to me, and return the lab materials to their original condition once the lab is completed. 4. Ms. Diane has a really fun and tasty activity she would like to share with you where you will make edible representations of sedimentary, igneous, and metamorphic rocks! Finally, we will be continuing to work on the MAP test. Hopefully, we can complete this requirement this week. In addition, I will have you start the science OAS test. Like the MAP test, this assessment is not something you can study for. Your responses will be used to identify your strengths and need so I can better plan my lessons for you. Please try your best on both of these assessments. We will talk about your performance on them at your first term parent/teacher conference. We had some fun this week exploring the many paths matter can take traveling around the rock cycle. We took on the persona of a type of rock (igneous, sedimentary, or metamorphic) and then used special dice to guide us around the cycle. It was easy to see that there is not one path through the cycle and that it goes on forever! Some students are using this experience as motivation to write a narrative about the rock cycle. Others are creating a children's picture book about the cycle to share with their younger proteges in Ms. Kirsten's room! Specially made dice guided us through the changes matter goes through as it moves through the rock cycle. Students moved around the classroom rolling the rock cycle dice while exploring the many paths through the cycle. I can't believe tomorrow is already Wednesday! The holiday weekend and my absence on Tuesday is making this week seem like a runaway train! 1. I will give you an introductory lesson on the rock cycle tomorrow. After the lesson, I will give you the Hard Rock Cafe Choice Sheet that will be due next Friday. You will see that you've already completed one of the choices: the vocabulary flash cards! That means you only have two more required assignments to do. In lab this week, we will model how matter travels through the rock cycle. This will take place during your afternoon lab block. You were given a copy of your vocabulary words to study for the week. Please be prepared for your quiz on these words this Friday. 2. Ms. Diane has already introduced you to using the distributive property. Upon my return tomorrow, I will continue with more practice on this topic. Please make sure you are completing all of your math classwork and homework that is assigned.